Procedures can be declared within any declarative region. The scope of the procedure will be limited to wherever it’s declared, architecture, package, or process. Whenever you call the procedure, it will behave like the code of the procedure was inserted where it was called from. A procedure doesn’t return a value like a function does, but you can return values by declaring out or inout signals in the parameter list. A procedure’s parameter list defines its inputs and outputs, kind of like a mini-module. It can be a signal or a constant, but unlike a module, it can also be a variable. The procedure can also declare its own signals, constants, or variables. These are only valid inside of the procedure. Unlike functions, procedures may contain wait-statements. Therefore, they are often used in testbenches like simple BFM’s for simulating interfaces, or for checking output from the device under test (DUT). In the previous tutorial we created a timer module using nested If-Then-Else statements. Each level of If-Then-Else inside of another If-Then-Else adds complexity to the design, and it becomes less readable. On each level of logic we are basically doing the same operation on a different set of signals. Isn’t there a better way to do this? We can see from the waveform that the wrapping of signals still work as it did in the previous tutorial. That’s because we haven’t actually changed the function on the module, only the way it’s implemented. The first item on the parameter list for the IncrementWrap procedure is the Counter signal. It’s declared using direction inout for the procedure to be able to both read and set its value. The second and third items on the parameter list are constants. This means that the values you put in here will appear as constants inside of the procedure. The WrapValue input together with the Enable input determines if the Counter signal is incremented or wrapped. The last item on the parameter list is a variable with direction out. The purpose of this output is to inform the caller of the procedure that the counter wrapped. We use it here kind of like a return value. In the main process we have four calls to the IncrementWrap procedure. Each of the subsequent calls use the Wrap variable to enable the counting. It wouldn’t have worked if we had used a signal instead of a variable, because signal values are only updated when a process goes to sleep. We need the output value from one procedure call to be be used as an input to a call on the very next line. Thus, it has to be a variable. Why do you need to double the `wait until rising_edge(Clk);` line in the test bench file? 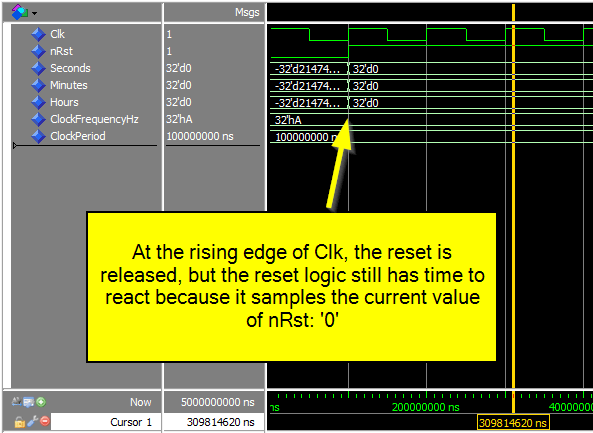 I added a double rising_edge(Clk) in the testbench sequence to make the reset active for two full clock periods. First, the signals have default integer values. Then, at the first rising edge of the clock, the reset logic changes the values to 0. Finally, at the second rising edge of the clock, the reset signal is released. It still works. The rising edge of the clock triggers two things within the same timestep (delta cycle). The reset is released and at the same time the reset logic kicks in. The reset logic samples nRst which is still ‘0’ at the time. 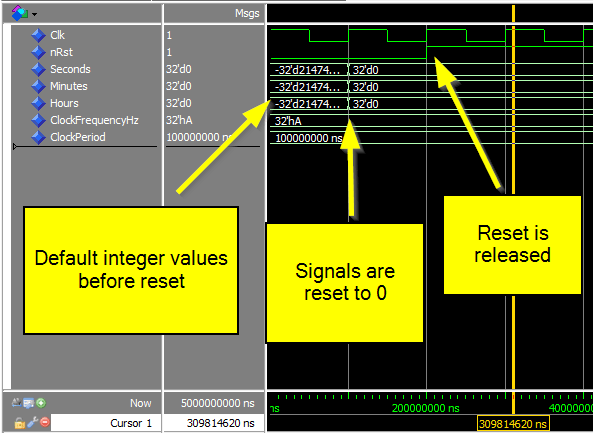 Therefore, the integer signals will appear to change at the same time as the reset is released. I should add that the reset signal is normally held for a number of clock period, not only one or two. This is known as a reset strobe. Thanks Jonas, that’s very clear now, and I’ll check what strobes are used for. A K M Shariful Islam Pathan. Loved the tutorial series.. Do you have any plans to make advanced vhdl tutorial series? It will be helpful if you make a video on modelsim… Thanks again..
Glad you enjoyed the tutorials! I am planning an intermediate VHDL course using FPGA development boards. I have also been thinking about teaching advanced testbench strategies. But a video only about ModelSim sounds like a good idea too. Thank you for the tip.